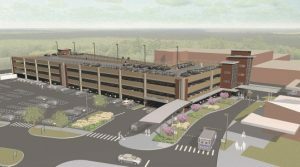 DAVENPORT served as a traffic engineering subconsultant for a new 616 car parking garage at H. H. McGuire Veterans Affairs Medical Center in Richmond, VA.
DAVENPORT’s scope of work included design and permitting for a temporary construction entrance and development of a traffic maintenance plan to ensure uninterrupted access to the existing medical center is maintained during construction. In addition, DAVENPORT’s team provided a peer a peer review of the Storm Water Drainage Design. DAVENPORT utilized our relationship with the City of Richmond to also provide coordination services for the project.